It comes up, from time to time, in discussions we have with each other. You're chatting with that long-suffering creature, the Intelligent Layperson, and you feel the urge to explain your professional interests to him/her. And, it has been established that n×n chessboards just don't cut it, or even 100×100 chessboards. It's time to identify some topics that really work - here's one I tried recently. Consider the following quote from the beginning of the paper Minimal Subsidies in Expense Sharing Games by Meir, Bachrach and Rosenschein, to appear in SAGT. Three private hospitals in a large city plan to purchase an X-ray machine. The standard type of such machines cost $5 million, and can fulﬁll the needs of up to two hospitals. There is also a more advanced machine which is capable of serving all three hospitals, but it costs $9 million. The hospital managers understand that the right thing to do is to buy the more expensive machine, which will serve all three hospitals and cost less than two standard machines, but cannot agree on how to allocate the cost of the more expensive machine among the hospitals. There will alway be a pair of hospitals that (together) need to pay at least $6 million, and would then rather split off and buy the cheaper machine for themselves. The question you ask your audience is, what will be the outcome of the negotiation between the hospitals? Hopefully, someone will begin by saying that 2 hospitals will share a $5M machine, and with any luck, someone else will suggest that the 3rd hospital will offer to share a $5M machine with one of the first two, and pay more than 50%. At this stage, you are in good shape. Even those on relatively high salaries, who don't expect their earnings to rise, will have to think twice about whether it makes sense to continue with contributions. This presents scheme managers with a dilemma - they have to keep the deal sweet enough to retain members and attract new ones, a problem that becomes much more urgent when a scheme is in deficit. When that happens, the whole thing is at risk of being sustained by promises that managers cannot ensure they will be able to keep. Here's a quote from that UCU question-and-answer page. Q: Aren't all public sector pension funds going to have to make changes to save money. Whys should academics have special treatment? A: USS is not a public service pension scheme, so it has to meet the same targets as other funded occupational pension schemes in the private sector. Its big advantages over such schemes are that the HE sector as a whole is less likely to go bust than any individual group of companies, so that it can afford to take a longer view. That does not mean that the politics of envy will not give traction to attacks on USS; but that is no good reason for the preemptive cringe that is part of what characterises the stance of the employers' negotiators. Full marks for emphasizing that the USS is not public-sector, but the usage of "politics of envy" made me cringe. 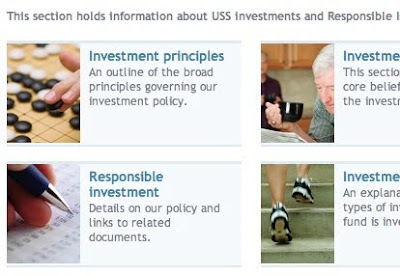 Finally, here's a fragment of the USS investments page to show that in some respects they have impeccable taste.